Hello there fellow taffers, and happy new year ! So I heard some people around here didn't like much what the Gold version adds to the original Thief. Yet it seems times that, while the Gold version previously was rather difficult to acquire, times have changed and now it has become the most easy to get, due do digital download releases such as GOG's and Steam's. Note that as this only patches files and does not include any original Dark Project content¹, this must be used on top of an existing valid installation of Thief Gold. I have attempted to ensure that it detects and handles differences between the GOG, Steam and CD release and it should also work with an installation of Gold that has the NewDark patch applied. Excellent work, thank you Constance. You've obviously put lots of time into this. Very much appreciated! A provisional test worked nicely. I installed GOG's release of TG to a new directory (specifically for this purpose, so did not bother with your copying instructions), ran your patch (FWIW it identified it as the "Steam" version, which I don't have) then applied the 1.19 patch and did a quick test, and there were no obvious problems. If you're open to suggestions at all, I would propose making certain changes optional? 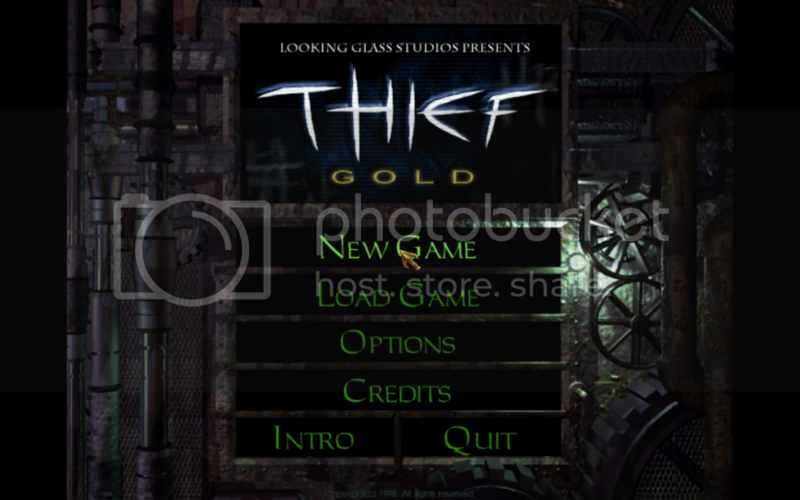 I've always "Dark Project"-ified the interface and movies in my own installations of Thief Gold, primarily because I find the "Thief Gold" logo tremendously ugly compared to the original, and also because the credit video for TG is just horrid, since they badly recompressed the original in the process of adding the additional credits, making it all blurry. I do realise that's not the intention of your patch, but if it was a fairly straightforward addition then it would be a really nice/simple way for people to keep the bits of TG that they liked, and revert the bits they didn't. In any case, thanks again for your fine work! Last edited by Shadowcat; 2nd Jan 2013 at 19:32. Hmm strange, I guess GOG must have somehow updated their installer since the day I first bought it, to include the ddfix. Re-downloading it now to see that by myself ^_^. Edit : yep, they did. Hmm I suppose it would be feasible, yet it would be a bit harder to keep the compatibility with Win9x since batch files there don't handle variable input from the user the same way as Windows 2000/XP and above (no "/p" parameter to the set command, but a "choice" command that doesn't exist anymore under XP+...). The movies and missions should mostly go together I guess, for coherence's sake. Last edited by Constance; 3rd Jan 2013 at 07:02. Ah, sorry; by "movies" I was only thinking of the non-mission movies which vary between the releases (just intro and credits?). A mission-related movie would certainly be considered part of its mission. If you did decide to pursue this, perhaps a config file could deal with the user input issue? Do you have any comparison pictures regarding this? Kind of curious about this. I've only played TG myself. Xeogred: Also the background of the original is animated. Last edited by Shadowcat; 3rd Jan 2013 at 17:05. I've yet to play the original. I like the layout and design of that menu screen of T1 better. I have to get around to playing it. Only played Gold once so it would be "brand new" again I think. Huh, yeah that gold logo does look a little tacky in comparison. Is the actual in-game UI any different though? Either way it sounds like the original is different enough that both should be played, so maybe instead of replaying Gold again already I'll give this a whirl. Heh ? Your's is different, it has the "Looking Glass Studios presents" text... I think I had never seen that on the Gold version. By the way, we are talking about the logo, not the background with mechanical stuff, right ? the animated thief gold logo has been added by one of (the many) TFix contributors. when I wrote "way too many fixes by way too many modders to list" in the readme, I wasn't kidding. Minor update "2013-06-18" is available. You don't need it if you already have downgraded your game using a previous version, it basically only can succeed in a few more specific cases and the script is slightly improved, but it doesn't change a thing about the game content you obtain. Well done, and an excellent idea. I own a hard copy of The Dark Project, but with Gold being the easiest version to acquire, it's awesome to finally have a tool to cut the fat out of the game a bit. A shame to lose Song of the Caverns, though. That mission is a real bright spot. Its been a while and I don't have a direct comparison, but what wasn't liked about TG? By the way GOG has recently updated its installer with the NewDark engine. Thus GoldToDark will not work with this GOG release, for it will be unable to find Thief.exe in the main game folder. That is, unless you restore the original Thief.exe from the Backup folder. For some reason also, it seems that their THIEF_ND.EXE is different from the NewDark 1.21's .exe (the most obvious modification is that they changed it's main icon) and so, it will not be recognized by GoldToDark as its md5 hash is different. Last edited by Constance; 23rd Jun 2013 at 04:33. Besides the fact that I've written a lot of articles there, it didn't really answer my question: what wasn't liked about TG? I guess there may be many different answers depending on who you ask this. For example I didn't like how long and confusing navigating in the sewers is in the Thieve's Guild mission, and didn't like the mages tower quite much — seems like key hunting to me. I also didn't like how they changed the mission in the Lost City, replacing Craymen and such creatures with mages. Wooooh, cool, just found this now. Great stuff! But i guess this release does not work with the Gold version i just recently purchased on gog? I would also like to go back to TDP from Gold... I thought to start tempering with my TDP original, but i guess the process would be a pain. Making some of the changes optional -- man that would rock. It would of course require editing of the levels, but in my dreams i imagine a lost city from TDP (which i also prefer, the mages there also seem a little "unfitting") with only 1 Talisman and Song of the Caverns being playbale as well. As for the credits movie: another mystery solved, and i was wondering if my eyes got so bad over the years (or my memory blurred) for stuff just looked worse. 1 - remove the ";" and following blank space before "sfx_channels 8" on line 19 of dark.cfg, then save it. Don't make any other change in this file.